PMMA, with a stainless steel axis, and a silicon rubber strip between the outside and the Limnotron wall to prevent wall growth. To create a different type of mixing more tailored to growth of cyanobacterial scums, oscillating grids have been designed. Originally designed to study pelagic communities, the Limnotrons have been adapted to allow for a benthic community as well. 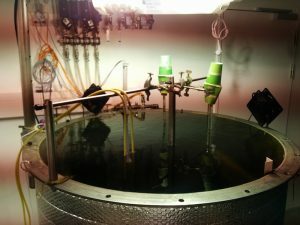 At present, each Limnotron can have a sediment layer of 10-15 cm, and with the recently purchased high intensity lights, a macrophyte community can be established in these mesocosms. A unique feature of the limnotrons is the temperature regulation with separate upper and lower temperature blocks to allow for thermal stratification. 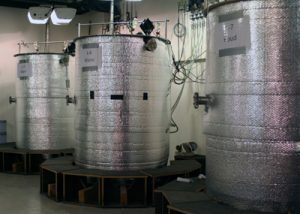 A thermostatically regulated microprocessor-controlled cooling and heating installation controls the temperature of each of the vessels individually at 0.1 oC SE. The temperature program allows for running complicated temperature scenarios, including episodic events. Temperature is logged every minute. 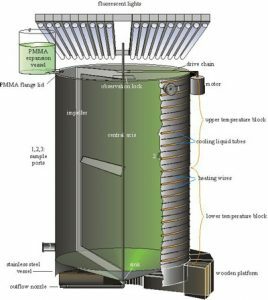 Because of possible volume differences due to temperature settings, evaporation losses and sampling, a (refillable) expansion vessel was developed, which maintains a constant water volume in the experimental vessel. In addition, CO2 levels can be manipulated as well, by providing different CO2 /air mixtures with a WITT KM60-2ME gas mixer. The Limnotrons can be used to test the effect of warming, eutrophication and CO2 elevation on carbon cycling, stoichiometry of different trophic groups, nutrient balances, metabolism, adaptation and microevolution and community structure of phytoplankton, zooplankton, macrofauna, periphyton and macrophytes.